Here at FAC, Richard, Daniel and Ben have had a busy November. Rather, they have had a busy Movember! 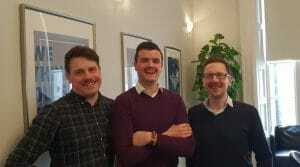 The guys have been growing questionable moustaches to raise awareness of (and to collect funds to tackle) men’s cancers and to promote mental well-being. According to Cancer.ie, 1 in 3 men will develop cancer in their lifetime with 1 in 7 developing prostate cancer. Figures from the CSO (2018) reveal that men are disproportionately more likely to take their own life. 80% of the 392 suicides in 2017 were male. With these stark figures, movements like Movember are a necessity in removing stigma and catalysing positive change. Many hours have gone into the careful growing and grooming of their mos, and FAC’s Mo Bros will be sad to see them go in the morning. Unfortunately, none of them have achieved a ‘tache that beats that of the legendary Tom Selleck. However, there is always next year to develop that Strategic Stubble! If you would like to support the Movember cause and donate, you can do so here.